Our education system teaches students to compete against each other for recognition and rewards. Having been taught collectively and tested individually throughout their formative years, graduates find the transition from learning to earning difficult because the teaching and testing processes are reversed. First-time job placements enter the workforce valuing only what they can do for themselves or can accomplish on their own. Sharing what they know with another student was considered cheating and those who were caught collaborating suffered negative consequences. Adhering to the education and socialization model they followed in school, young people, in an effort to be accepted, tend to join cliques made up of people who look, think, speak, and act like them. Cliques are like miniature societies with mindsets of their own. When the goals of a clique are not in alignment with those of other work units, performance and productivity decline. If left unchecked, an organization can become dysfunctional simply because its workforce lacks the confidence, ability, and desire to work together. Here is how one frustrated CEO broke up the self-serving cliques that were dominating his company and reassembled them into collaborative work units. Ron was fed up with the destructive competition between his production crews. Cliques of mostly new hires, who thought it was clever to sabotage the “old timers,” were disrupting the workflow at several key assembly stations. Many of the Doers, who had held things together in the past, were either gone or getting ready to leave. 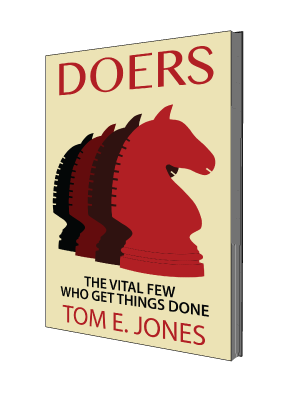 If Ron were going to turn things around, he would need to rally the remaining Doers and give them the authority to lead the charge for change. In desperation, Ron called the department heads together in the conference room and posted the names of every supervisor together with a ranking calculated from their past performance reviews. After explaining his intention to break up the existing cliques, he directed them to pick new supervisors in an NFL-like draft. Realizing the stakes were high, the department heads made certain to pick one of the Doers still on the list each time their turn came around. Any supervisor not selected was assumed to be a non-performer and was given the choice of demotion to line worker or resignation. Those supervisors picked in the draft were immediately enrolled in an extensive Performance Management and Process Improvement training program. This seemingly bizarre strategy rapidly rejuvenated the workforce by instilling a collaborative spirit throughout the company.